Film lover Ben Solovey had one goal: Make the worst movie ever look the best it could. But now the film will see the light of day again on Blu-ray and in a new restoration from a successful Kickstarter campaign headed by Ben Solovey, a cameraman and admirer of the film. I talked to Solovey about why he would want to restore what many have called the worst movie ever made. Sean Hutchinson: I’ve struggled with just how to describe Manos to other people. How do you usually describe Manos to people who are unfamiliar with it? I actually was in the unenviable position of having to write the synopsis of the back cover of the Blu-ray. They made me do that. In essence I just describe what happens [laughs] . It’s one of those things you’d imagine Hal Warren, the director, would even have a tough time describing to people. I would love to hear what he had to say. Restoring movies isn’t your day job. What’s your filmmaking background? In 2008 I graduated from Florida State with a movie, TV, and recording arts degree. I immediately went to Hollywood on a Panavision internship, so I stayed there and worked camera rentals for a while and became a camera assistant. I’ve done a lot of EPKs — that’s electronic press kits — that’s a lot of videos where I interview people on projects and follow musicians around. This will be the first Blu-ray I produce start to finish. I’ve shot things that ended up on other Blu-rays as extras, but this is the first I’ve done myself. I was introduced to Manos because of the classic episode of Mystery Science Theater 3000. I think a lot of people first came across Manos that way. Was the MST3K episode your first time seeing the movie? Yeah. It was a great way to find the movie on video without hunting forever because we didn’t really have the internet to buy any movie you want at the time. It was kind of grey market video catalogues and stuff. Maybe you could find a copy of the movie there, but to really see the movie on store shelves you saw it on the episode. And because the movie is in public domain, the episode never went out of print. I think I even remember seeing it at Blockbuster, if you remember those. If there was an episode of that show on video in a store it might well be that one. I don’t think it’s ever gone out of print since the mid-to-late ‘90s. How did you start off this journey to restore Manos? You first got your hands on the film materials through an eBay auction, right? I saw the auction after it was already over, but it had gone unclaimed, so I made an offer on a small chunk of that collection. It turns out they wanted to get rid of everything, so I ended up with a car full of film reels that weren’t clearly marked. But I had a general idea of what titles were in there. Having traded and bought film prints before — there are lot of film collectors in L.A. — I knew I could at least make my money back selling extra prints beyond the ones I wanted. There were four or five copies of the The Atomic Brain, for instance. And we’re just talking about 16mm. There was a lot of 35mm as well. That’s the stuff that wasn’t as clearly marked, but often turned out to be camera negatives. What was the state of the Manos film reel when you realized what you had? 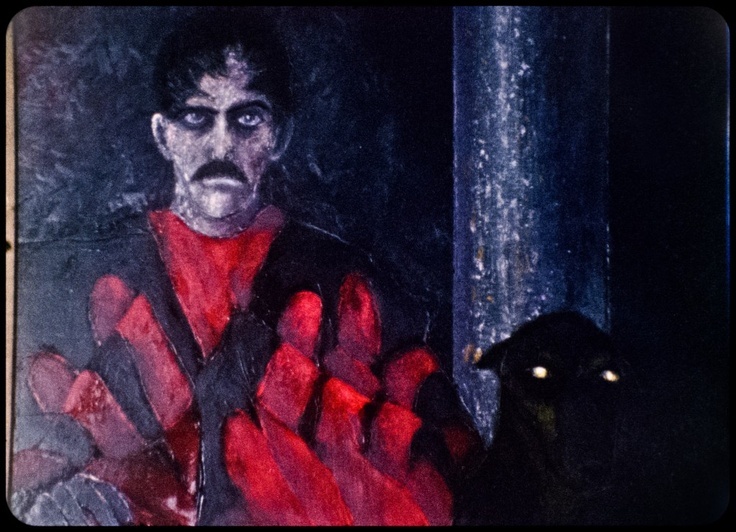 Manos was shot originally on 16mm. I had a lot of incomplete internegatives for duping and there was also an Ektachrome work print, which about 60 percent of the restoration came from. Then there was about 40 percent of footage straight out of the camera. So I had some very, very good looking footage and some very, very shoddy footage that wasn’t intended for public consumption. Nothing was complete, so the movie had to be patched together. What was it like pulling the elements of the physical film from different places, considering it wasn’t all in good shape? It needed help. That’s why I went with the fundraiser. It couldn’t just be slapped on a scanner to see what worked. Actually there was one thing that was complete. There was one 16mm theatrical print like you would see in the drive-in, but it was completely faded. All the colors were bad. So you’ll see that as an extra if you buy it on Blu-ray. Why did you think Kickstarter was the way to go? Because everyone I showed the screenshots of the film to were saying, “You have to do a Kickstarter!” I was showing the stuff off on Facebook and various forums, and it was at the point where people were requesting it, so I thought it was probably a good idea. The Kickstarter made its goal fairly quickly, and made well over the original goal amount. Where did that extra money go? Just to the restoration? Yeah, it was like 40 days. The extra money went into making the final product better. Also it helped produce extra features for the disc. But we did eventually quadruple the initial goal. If it was just the initial goal we could have done a dirty but still watchable result. But I wasn’t sure how many people would want it, to be honest. A lot of people talk it up, but it’s quite another thing to actually invest in the movie, and I’m amazed that enough people did. They really seem to like it. Why do you think people gave up their money to bring back a movie that has a reputation of being the worst of all time? Something about that infamy really resonates with people. An awful lot of people who are filmmakers themselves love the movie. They see a bit of themselves in the movie. Not in a bad way, just that everyone remembers the first time they picked up a camera and put something together, and it looks exactly as bad as that. I think that’s part of the reason some people seem to like it. Also just the fact that this is now 1960s ephemera, and you can clearly see the style at work. Having been to the city of El Paso, where it was shot, it doesn’t look very different today except for clothes and hair. The actual locations are basically all still there. So it’s a blast from the past a bit, but also something that filmmakers relate to. What was the actual restoration process like? What did you use to restore and digitize the film elements? First, we started with two reels on a hand crank going through each, and actually making notes about the condition of frames versus other things. There was a lot of pre-research involved. We had archivists take a look at it, and they were very helpful. It became clear early on that we had to do it digitally. We couldn’t do it photochemically because the blow-up process is complicated, so if we expanded it to 35mm we would have lost some picture quality. There’s also just some damage to the actual film that would be better to preserve digitally. So we had the opportunity to digitally scan the film it in 2K or 4K. After doing some scan tests, and realizing it was on reversal stock, which doesn’t have much latitude and has pretty large film grain on the image, there was really no reason to go 4K. So we ended up scanning 4K, but actually worked with it in 2K. Did you ever think during the restoration process that making it into a 2K restoration would spoil the “look what we found” quality of people discovering this bad movie? I feel like one of the reasons people latch onto it is because of the poor quality. And maybe that’s one of the reasons why you did include the low-quality version on Blu-ray. Well, the quality is still poor, it’s just in a different way. It’s in a way where it’s closer to how it actually looked back in 1966 when you were looking at it in the theater. It’s just a new way to watch it. The restoration doesn’t necessarily take away from that experience, I’m pretty sure. When you watch it I think you’ll find it’s just as bad of a movie or as incompetently made. If anything, you’ll see more incompetence now than before. Something about it being much more colorful and much more easy to see doesn’t make it a better film. That wasn’t the goal. Making it a better film was never the goal. Accurately representing the actual physical film itself was the goal. In a complicated way, I guess that’s that. The restoration brings it to today’s media quality that we’ve come to expect on Blu-ray, but it’s also in service of what the movie should look like if it was projected as opposed to on a bad VHS. You can keep your bad VHS if you like, I don’t want to take those away. Was the Blu-ray always the end result of the project? No, the Blu-ray was just an incentive of an important milestone. What we really wanted to do was save this project from the dumpster. The film was rotting away rapidly. It was in terrible shape. It looked bad, and I didn’t think anyone else would do it, so I did it. It was to save the movie because it could have been lost. Today it could have only existed on VHS tapes and we wouldn’t want that. It is definitely one of those movies that’s difficult to gauge with someone else. I was curious before talking to you to see if you would outright say it was a bad movie. Sure. But the more movies you watch, the more you realize that good and bad are two sides of the same coin. It was all about clarity and intention and whether the stated goals of the movie are even approached. Doing something different is hard enough! But even by the standards of when it came out — I mean this came out the year The Good, the Bad and the Ugly came out. So yes, it was possible to make a truly excellent movie that year. And even with that same budget and equipment, it was possible to make a truly excellent movie. Carnival of Souls and Night of the Living Dead also came out around that time and were also on 16mm. They were all being made cheaply. So you could have done a lot more with that budget, but Manos definitely falls short in every way. We have a couple of outright classics that were made on similar circumstances. The difference is those people had the potential filmmaking experience. I think that’s the main reason why Manos is the way it is. There is no filmmaking experience to speak of in this movie. It’s pure id. There was some controversy over the public domain status of the movie itself and even the legality of your restoration. What’s the status of that at this point? I don’t know if it’s controversy or if it exists in one guy’s head. But so be it. We did have to do our homework and make sure the film was in the public domain. And even after we’ve done all that, one of the sons of the director of the film seems to believe he owns it. He was never able to prove that, but we had to take it seriously because we got a cease-and-desist from him. So my intellectual property lawyer and I gave it due diligence and it seems that the threat is no more. It’s too bad because I know this fellow has some interesting stuff to share about his dad, but in order for him to share it he would have to admit that he doesn’t own the movie. But that probably won’t happen. What kinds of things does he have in his possession that you wanted to see? He has the un-produced follow-up script for a sequel. He has the original painting of the Master from the movie. He has a lot of stuff to share, but he won’t share it with me now. He thinks I’m just in it for a buck, so that ship has sailed. Really, I just broke even on this project. The money went to restore the movie, as it should have. My accounting is solid [laughs]. Basically any Kickstarter or fundraising campaign has the cost of incentives built in to every donation — $10-$15 of that goes towards the cost of the disc and selling the disk. Some of it goes to a T-shirt for you, some if it goes to postage, etc. I wanted people to have some stuff to enjoy well before the disc came out. I wasn’t aware of how long it would take because of the legal threat. It really added like two years of the process, unfortunately. However there will be no such delays for the next project I do. Are you going to try to restore any of the other reels that you bought? Yeah! In that collection the was The Atomic Brain and it’s in much better shape than Manos. So we’re starting from better results. We’re starting from the original camera negative, which is complete. It looks so much better than that movie has ever been presented. It’s got really nice black and white photography. It was made by a really interesting guy named Joseph Mascelli, who’s great especially if you’re a cinematography geek like myself. He was one of those guys who also wrote a lot of books on the craft of cinematography. In his actual career he was also shooting a lot of B-movies. He shot The Incredibly Strange Creatures that Stopped Living and Became Mixed-Up Zombies. But The Atomic Brain is his only directorial credit. That’s just interesting to me and I hope other people feel the same. Ed. Note: The Incredibly Strange Creatures that Stopped Living and Became Mixed-Up Zombies and The Atomic Brain are also available in two other classic MST3K episodes. Are you going to Kickstarter with that too? I don’t know yet. I’ve been asking around to see if anyone will legitimately fund a new restoration. It may very well end up being another campaign for that. Maybe not on Kickstarter, maybe somewhere else. Is restoring films something you want to keep doing, or do you want to just focus on the collection you bought? I’d love to work on other people’s movies, of course. I think there’s so much film footage from the 20th century that cannot be gotten-to in time if more independent sources aren’t also fixing them up. Institutions, universities, archives, places like that that often have these movies have to get grants, and they have to figure out where that money will go. There are limited resources there. But for movies in the public domain there really shouldn’t be any obstacle because we’re the public, we own it, and we can fund a restoration of Manos or The Atomic Brain if we want to. And if enough people want it, it’ll happen. That’s pretty democratic. I think it’s pretty fair. I hope the new project will be just as successful. I can do The Atomic Brain after Manos because of the superiority of these sources. It’s just a lot less money and a lot quicker. I’m estimating a nine month turnaround time, which is what I’d love to do. If you can restore one movie, maybe that’s a fluke. If you can restore two, that’s no fluke. So you want to try to do this more full-time? I wouldn’t be the only one juggling careers in that aspect. You have people like the owner of Grindhouse Releasing, Bob Murawski. He’s this Academy Award-winning film editor who edited The Hurt Locker. But he also releases classic horror movies like Fulci’s Zombi movies. So, last question: What is your favorite part of Manos — if you can even have a favorite part? I’m a Torgo fan myself. That’s kind of when Torgo shows his potential. We get more sense of their history. I guess that’s the most history we get in Manos.